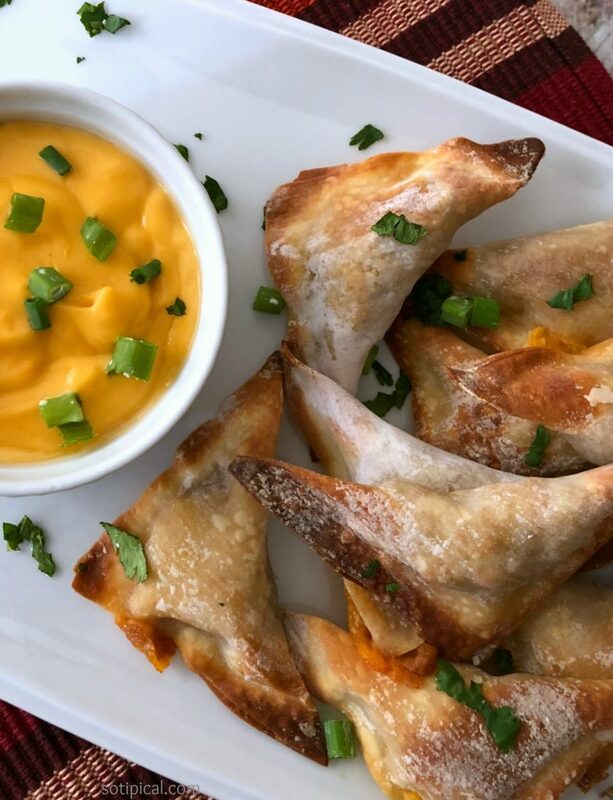 Baked Stuffed Nachos are a great, easy way to enjoy your favorite snack. We love them because the mess is less and the toppings stay inside, rather than falling off the chips! My new go-to party food! Try them! You won’t be disappointed! I picked up some Ricos Cheddar Cheese Sauces at Walmart to serve with this recipe. They are all Trans Fat FREE and made with no hydrogenated oils. All you have to do is just heat and eat! 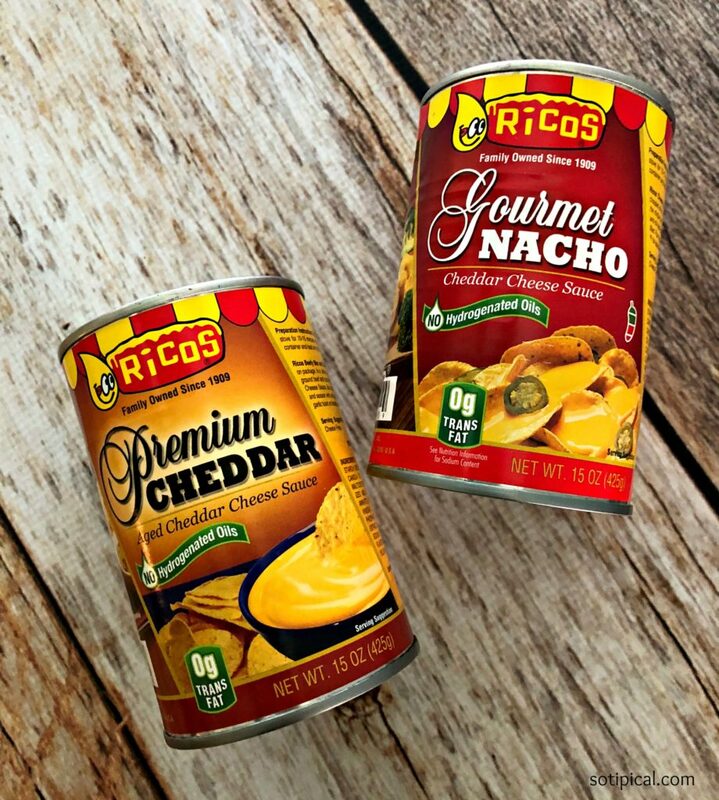 Ricos Cheddar Cheese Sauces are perfect for watching the game, after school snacks, entertaining, parties, potlucks, holidays, bbqs & more! Enter the Ricos Cheese Truck Sweepstakes and win a New 2018 Ford F-150 HERE!!! Its easy-peasy, nacho cheesy! Preheat your oven to 425 degrees and line your baking sheet with parchment paper (for easier clean up!). Prepare your ingredients for easy assembly and get ready to make some stuffed nachos! On a dry surface, lay out a few wonton wrappers. I find it easier to make 3-4 at a time, but you could lay them all out of your baking sheet too, if preferred. 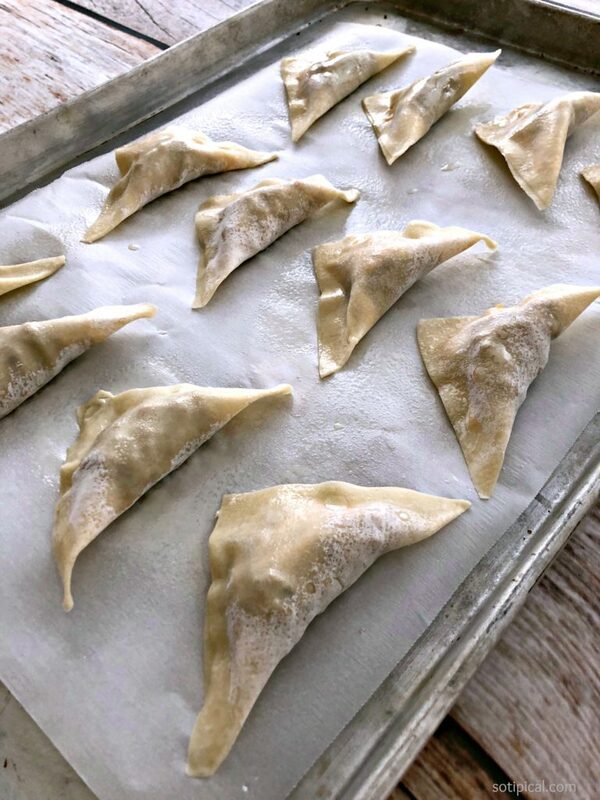 Add 1/2-1 teaspoon of filling to the center of each wonton and sprinkle lightly with shredded cheese. Do not overstuff or the wrapper will tear. Carefully moisten the edges with water. You can use a pastry brush or your finger. Fold the wrapper in half and press the edges to seal. Again, handle them carefully or the wrappers will tear and your filling will ooze out during baking. Some of my nachos have taco meat but shredded chicken would be great too! I also made some with just beans and cheese for a vegetarian option. There are different wrapper options you can use. Today I made triangles, but you can also make squares. 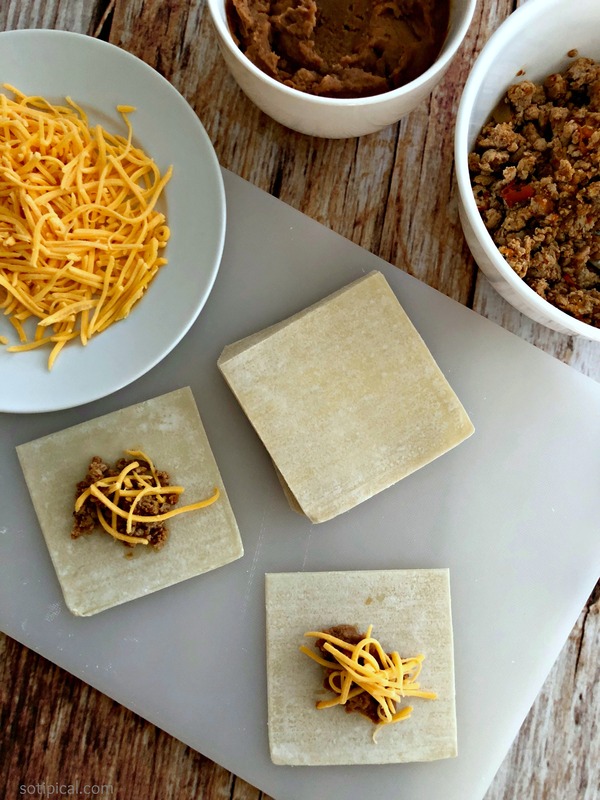 For squares, place 1 tsp of filling in the center and seal with a second wrapper. It would resemble a ravioli. 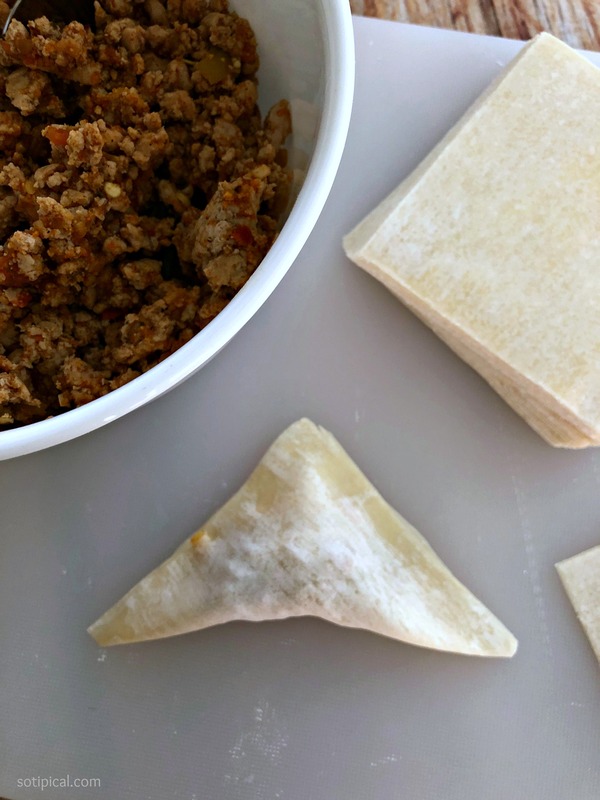 Wonton wrappers also come in a round, circular shape and they would look like cute little mini tacos when done! 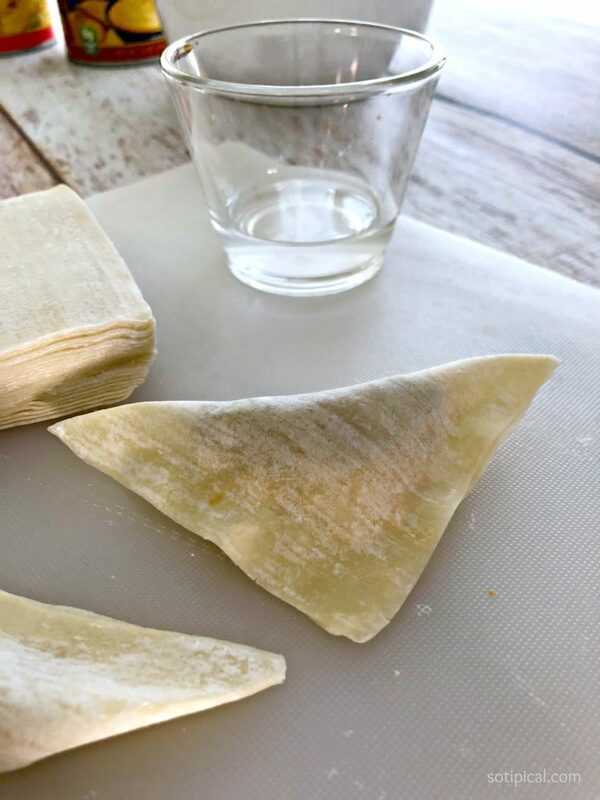 (Another option is to turn these into baked egg rolls if you use the larger square wrappers.) So many choices! Line them up on your baking sheet and lightly spray with cooking spray. Bake for 5-7 minutes per side. This may vary depending on whether your oven runs hot. Just keep an eye on them so they don’t burn. 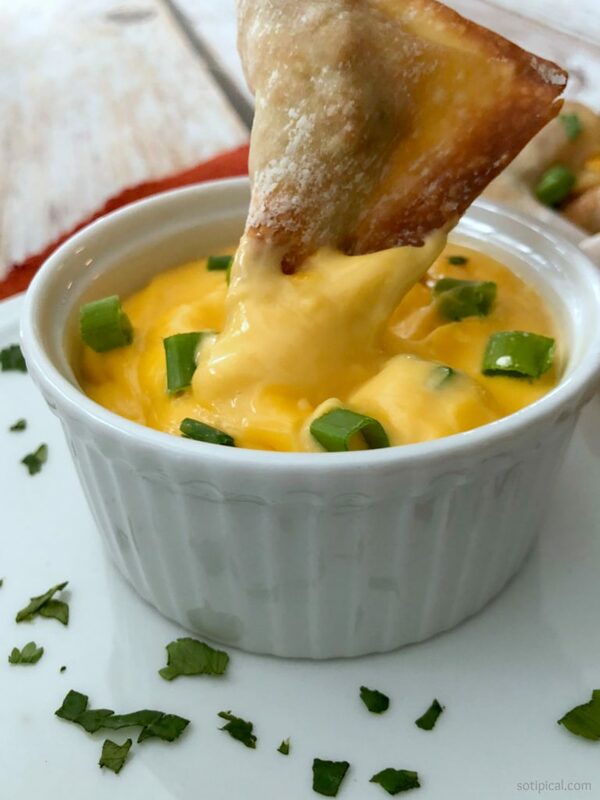 While baking, heat up some Ricos Gourmet Nacho Cheddar Cheese Sauce. If desired, top with some chopped green onion, cilantro and/or sliced jalapeños! Remove the stuffed nachos from the oven and allow to cool for a few minutes before serving. Dip and enjoy! These were SO GOOD! We literally ate them all in a matter of minutes! I had to make another batch! 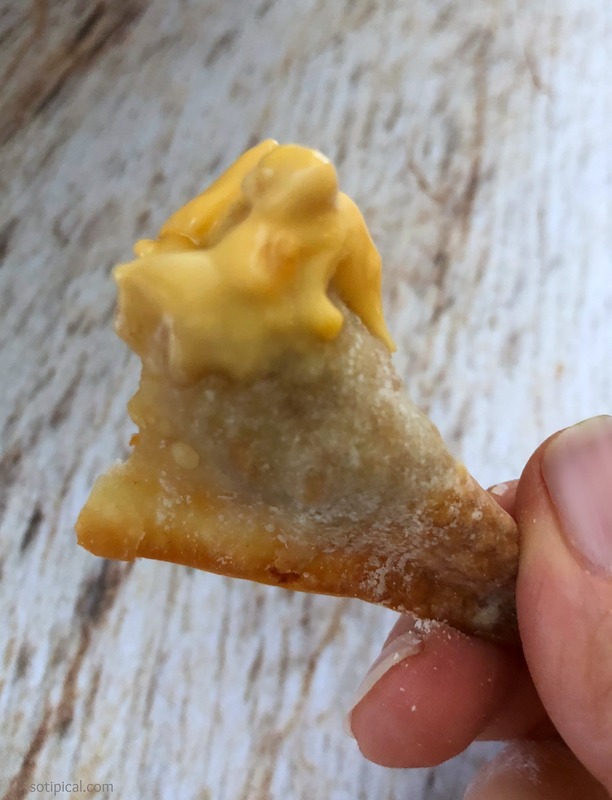 I also doubled the amount of Ricos Gourmet Nacho Cheddar Cheese Sauce because we like our own little cups of cheese sauce, because lets face it, we are “cheese-aholics” and double dip every bite! What a fun and unique recipe! I cannot wait to give these a try. They look so good, and easy-to-make, too! Thanks for sharing it! Thank you! Hope you enjoy them as much as we do!